Here’s the latest on what Bryant and his former team have said about each other. Dez Bryant has been a free agent since the Dallas Cowboys released him in April. Bryant has mostly stayed out of the headlines since, other than when he reportedly declined a multi-year offer from the Baltimore Ravens. That changed this week as training camp started up around the NFL. First, the Cleveland Browns publicly acknowledged that they have had discussions about adding the veteran wide receiver — a pairing that might seem like a joke, but actually makes a lot of sense. Then, the interest seemed to ramp up on Friday, when Ian Rapoport and Mary Kay Cabot both reported that the two sides could meet, and potentially get a deal done, soon. Shortly after, Bryant made waves, but it didn’t have anything to do with a new team. Instead, it had to do with his old team, the one he had played for since it drafted him in the first round in 2010. Bryant’s criticism of the play-calling — not an uncommon complaint among Cowboys fans — is directed at offensive coordinator Scott Linehan. Bryant hinted that center Travis Frederick and linebacker Sean Lee were involved in his release from the team. Both veterans said no one consulted them when it came time for the Cowboys to cut ties with Bryant. Bryant has always had a special relationship with team owner Jerry Jones, and that didn’t end the day Bryant stopped being a member of the Cowboys. 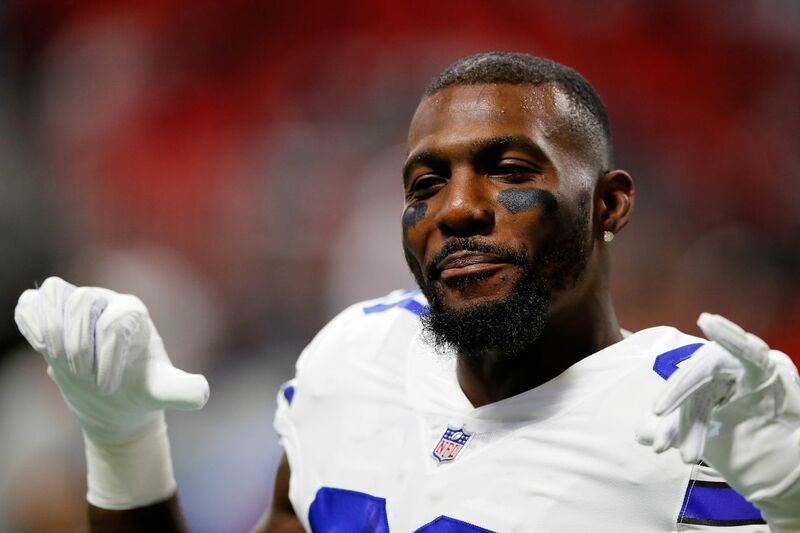 “Dez and I share a personal and professional relationship that is very strong, and he is one of just a handful of players with whom I have become that close to over the past 30 years,” Jones said following Bryant’s release. The Cowboys took a step back in 2017, particularly offensively. Prescott couldn’t match his Offensive Rookie of the Year season, Elliott was suspended for six games, and the team went from 13-3 and a No. 1 seed to 9-7 and missing the playoffs. Bryant played all 16 games last season, for the first time since 2014. He also led the team in receptions (69), receiving yards (838), and touchdown catches (six). But none of those stats are spectacular, and they’re far off from his 2012-14 peak, when he was averaging more than 1,300 yards per season and double-digit touchdowns. Sure, Dez Bryant is no longer a Cowboy because his salary cost too much. Because his production had dipped. Because he turns 30 this year and age and injuries were factors. Because his “distractions” and emotional outbursts in games, in the locker room and beyond grew tiresome. This, however, cannot be denied — the Cowboys concluded that Dez doesn’t work for Dak. So, that doesn’t work for the Cowboys. After he was released, Bryant said he would like play for another NFC East team so he could get a chance to play against the Cowboys. That seems unlikely to happen, though Slater said that an unnamed team — not the Browns — was interested in Bryant and wasn’t put off because of his tweets. 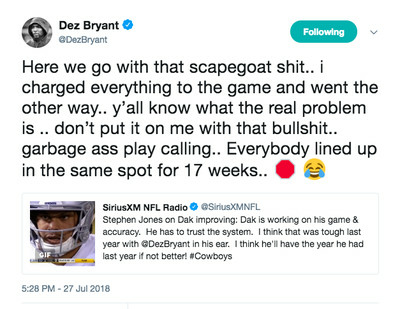 But by turning down the Ravens’ offer, Bryant made it known he wants a one-year “prove it” deal to show he’s still the player he was back when “Did Dez catch it?” became a saying. One team will sign him, and probably pretty soon. We’ll just have to wait and see if he’s still got it, and if the Dallas offense can rebound. Bryant is obviously not counting on the latter.